Who is the Master of the Maze? His legend began twenty five centuries ago. Ancient Greek vases show a bull-headed man who ruled the centre of a labyrinth with an enormous double-headed axe - a primal figure of savagery and terror. 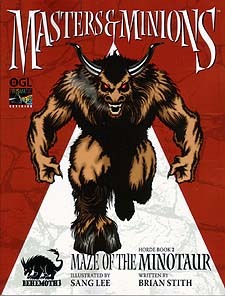 Thirty years ago, as roleplaying games were being born, the first modern adventurers faced their first minotaur. Since then, millions of players have mapped his dungeons, looted his treasure, and slain him with swords, spells, and twenty-sided dice. We thought we knew all about the master of the maze. Turns out we hadn't even met him yet. Open this horde Book and rediscover what the first civilizations knew: Believe in monsters, and fear the maze of the minotaur. Roll your own legends - believe in monsters again.